PC Magazine has once again given Voxox a verbal high-five by ranking it among the "Best Free Software of 2011", an annual compilation of the year's best free downloadable software applications in 35 categories. 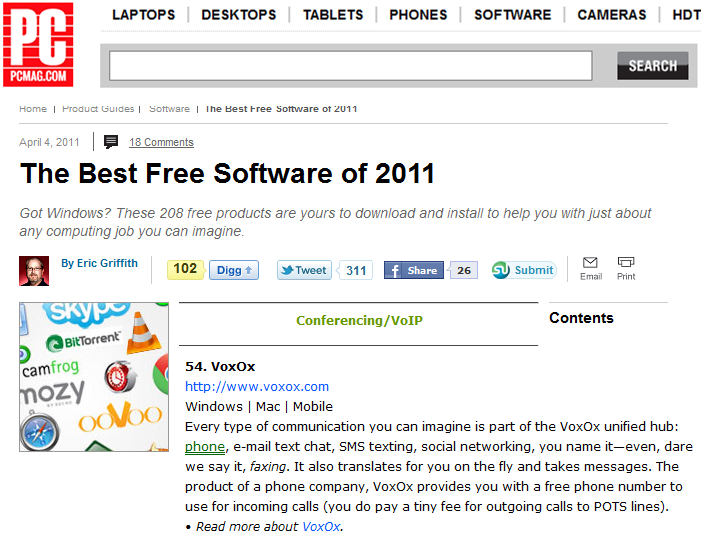 PC Mag featured Voxox as one of five free services in the “VoIP and conferencing” category, which also includes Skype. Eric Griffith, feature editor for PC Magazine, writes:“Every type of communication you can imagine is part of the Voxox unified hub: phone, e-mail text chat, SMS texting, social networking, you name it—even, dare we say it, faxing. It also translates for you on the fly and takes messages. The product of a phone company, Voxox provides you with a free phone number to use for incoming calls." This is the second year in a row Voxox has made the list and we hope to see our name on there again! Check out the article to see what else PC Mag has to say about us and this year's free software market. If you still don't have Voxox, get your free account here and start unifying your communications!